Indonesian currency is called the rupiah (IDR) and was redenominated many times up until its current 2016 issue. The Indonesian rupiah's named is based off of the Indian rupee. Coins of the Indonesian rupiah are rare under 100 rupiah due to inflation. The highest coin denomination goes up to 1000 rupiah. The latest Indonesian currency set consist of the denominations 1,000 to 100,000 and each features hero’s from Indonesia and dances that represent the culture. The light green 1,000 rupiah note features Tjut Meutia, Banda Neira and the Tifa dance. The gray 2,000 note has an image of Mohammad Husni Thamrin, Sianok Canyon and the Piring dance. The orange 5,000 Indonesian banknote has Idham Chalid, Mount Bromo and the Gambyong dance. 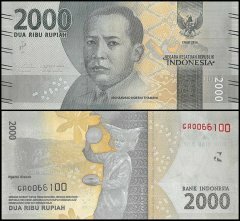 10,000 rupiah note is light purple features Frans Kaisiepo, Wakatobi National Park and the Pakarena dance. The dark green 20,000 banknote has Sam Ratulangi, the Derawan Islands and the Gong dance as its theme. The 50,000 bill features Djuandaa Kartawidjaja, Komodi National Park and the Legong dance. Lastly, the pink 100,000 note has Sujarno and Mohammad Hatta with the Raja Ampat Ilands and the Topenf Betawi dance.